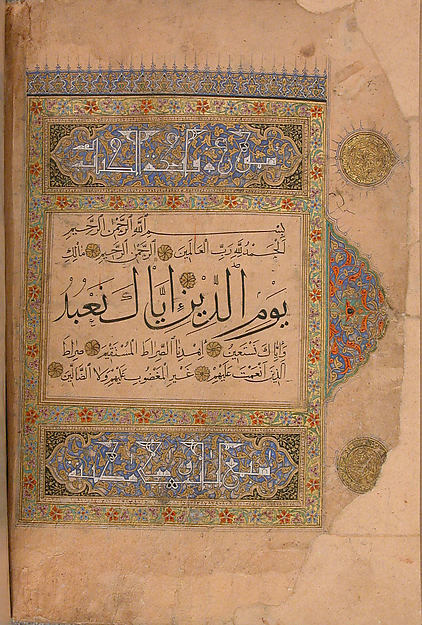 This is a fifteenth- or sixteenth-century manuscript of the Qur’an, the central religious text of Islam. 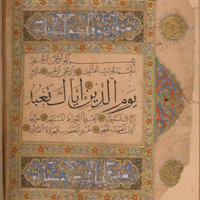 The Qur’an is said to contain the words of Allah as revealed to the prophet Muhammad. This particular manuscript displays exquisite calligraphy with designs of medallions on the margins, which indicates its provenance in Ottoman Turkey. “Qur'an Manuscript (15th-16th century) from the Metropolitan Museum of Art,” Medieval Hollywood, accessed April 24, 2019, http://medievalhollywood.ace.fordham.edu/items/show/90.